In this week's episode of Mad Genius Tips, F&W Test Kitchen wizard Justin Chapple demos an easy, DIY way to make spiral hot dogs. If this knowledge has you wondering about other ways to customize and accessorize your hot dog, you might be intrigued to learn of these five oddball tools. This device turns an ordinary sausage into what the maker describes as a “happy hot dog man.” Find wardrobe inspiration here. Burger or dog? You don’t have to choose—this tool makes hot dog-shaped patties of ground meat. 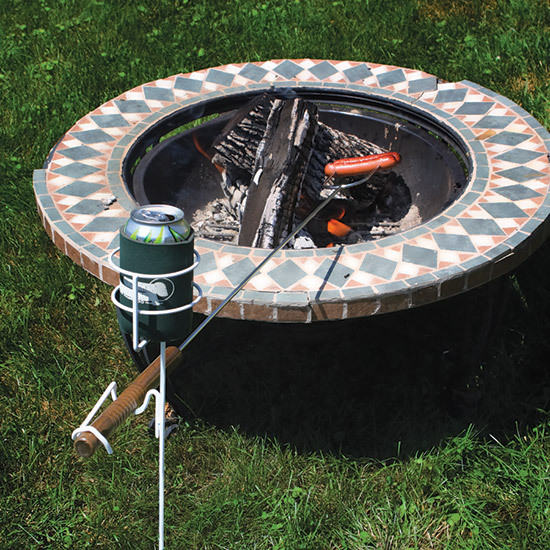 This camper's helper will hold your hot dog over an open flame and cradle your beverage within easy reach. Skip the trip to 7-Eleven. This appliance allows you to bake healthier, mess-free corn dogs in the comfort of your own home. Bonus: It makes other nutritionally horrifying carnival foods like Snickers on a stick. This gadget dispenses both ketchup and mustard from a double-barreled toy gun. You might be tempted to buy two for your next cookout, but keep in mind that it's all fun and games until someone gets a crazy bill from the dry cleaner.